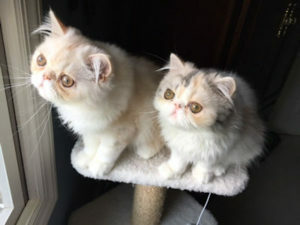 The article below was written by one of my kitten buyers who purchased two littermates in 2016. As it turned out, the male, Ellison, was diagnosed with hip dysplasia. Up until Ellison, I had never heard of hip dysplasia in cats. I did not know it was even a possibility in cats. When I wrote the article for last month's (December 2018) newsletter, I had forgotten about Ellison and his hips. Jen U. gently reminded me of Ellison. I asked Jen if she would be willing to write about their journey with Ellison and his hip issues. The purpose of her writing about Ellison's journey is to demonstrate a cat can live a normal life even if diagnosed with severe hip dysplasia and that the diagnosis of "hip dysplasia" in a cat does not always mean that surgery is needed. My husband and I adopted our two Persian sibling babies, Abby & Ellison, from Susan back in April of 2016. They are Funfetti & Diggie babies. As required in the health guarantee, we brought them to our vet a couple of days after they joined our family. Both kittens checked out great except for a “click” that the vet felt when she moved one of Ellison’s back legs - she pointed it out to us, and we also felt it. We then mentioned that we had noticed that when he would play and jump, he wouldn’t land on his feet. He’d jump high in the air and then land on his side. We thought it was odd, but initially attributed it to him being a clumsy kitten- and I guess even now we still don’t know for sure that it was related to an issue (he DID outgrow this after a short time). 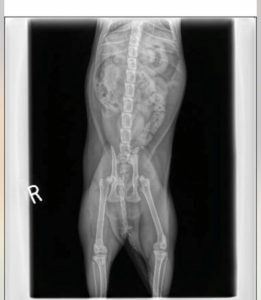 At the time of the initial vet appointment, the kittens were around 13 or 14 weeks old, and we opted not to do an x-ray immediately as the doctor said that with him being so young he could outgrow whatever it was, and she’d want to have a look at it again anyway at around 10 months when his growth plates had closed. So we decided rather than put him through two rounds of x-rays in his first year of life, we’d just wait until he hit the 10-month mark to take a look at it. Without knowing exactly what was going on, we decided to proceed with the Cosequin injections for five days that the vet recommended. She said it would help lubricate his joints and certainly couldn’t hurt. I had a diabetic Persian in my household growing up, so I was prepared to administer the injections myself and did so as instructed. The following months, we watched him run, jump and play just like his sister Abby, and if there were something wrong with his hip, you’d never know it by how he acted. He seemed like a normal, active kitten to us. Around the 10-month mark, we set up an appointment at the vet’s office to have the x-rays done (pictures to the left and below). 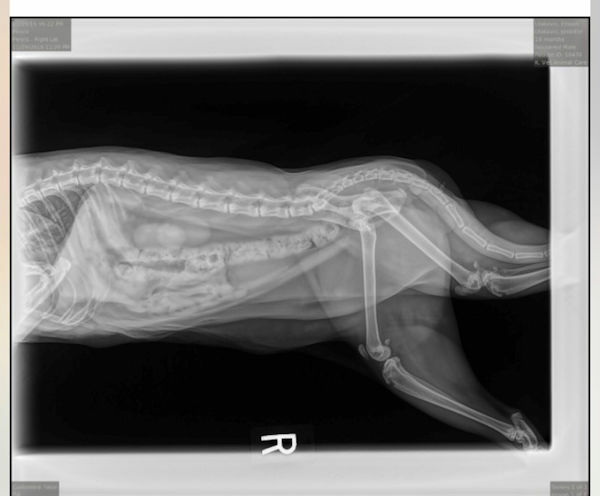 The doctor herself was not there that day, so one of the vet techs did the x-rays. A couple of days later, we got an upsetting call from the vet. She was very concerned and said that both of Ellison’s back hips look terrible on the x-rays ... one being worse than the other. She even went so far as to say that she cannot believe he is even able to walk - let alone run, jump and play - without any symptoms. She said she was having the x-rays sent to a place that would read them and give a formal interpretation/diagnosis, which we agreed to. 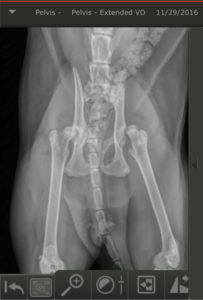 Once we got that report back, along with the x-rays, we saw that the interpretation of the x-rays confirmed the hip dysplasia diagnosis and suggested that he would be a good candidate for FHO surgery (Susan mentioned this in her hip dysplasia article in last month’s newsletter). Our vet recommended that we go to a specialist to see if we should take any action immediately while he was young- or if it was a “wait and see” type of thing. She said that she wanted the specialist to examine Ellison in person because just looking at the x-rays alone, you would want to do the surgery instantly. But with a cat that had no symptoms whatsoever, she wasn’t sure what would be recommended. That appointment was over two years ago, and Ellison is still doing great. My husband plays with him a lot every day, and he LOVES hunting his favorite feather wand attachment - all the while running, jumping and spinning. He and his sister run around crazy every single day – I actually think having another cat for him to play with helps a lot. He’s dominant, so he is typically the instigator - but they run, jump and sneak-attack each other and it helps to keep him active. We are also giving him Life’s Abundance Agility Formula supplement every day. It’s more comprehensive than Glucosamine alone, as it helps maintain healthy joint cartilage and connective tissue, and aids in the production of healthy synovial fluid, which lubricates the joints. Once in a while, Ellison gets what we refer to as “twitching” in his lower back/leg area and tail. Not sure how else to describe it. It basically just seems like his reflexes in his lower back are bothering him, and he is almost running away from his own tail. When he had a “flare up” he would run and hide and be antisocial for a few days which was opposite of his normal personality, so we knew it was causing him pain. While we don’t know for a fact that it was due to his hips (the vet said it may or may not be), we wanted to try to find a way to help alleviate this. We now take Ellison for preventative VOM (Veterinary Orthopedic Manipulation) treatments every three months or so to try to keep his hips in good shape and hopefully avoid having the surgery altogether. VOM is a healing technology that locates areas of the nervous system that have fallen out of communication, and re-establishes communication and induces healing and alleviates pain. It uses non-invasive instruments to “talk” to the nervous system via instrumental stimulation. Done by a licensed animal chiropractor, it is painless, and there is no manual manipulation at all - that’s the part we like about it. He tested the devices on us, so we know it’s painless. The doctor said that it would help Ellison’s body recognize his joints as “normal” so as not to react as if there was an issue- and if he had any pain associated with his hips, it would alleviate that. During the first appointment, you could see the imbalance in Ellison’s lower spine and hips (he had some elsewhere too, actually), and those went away by the end of that same treatment. The treatments are only 15 minutes long, and they don’t seem to bother him (now the car ride to get there is another story)! We started out with weekly treatments and had worked our way up to once every 12 weeks, and Ellison’s body has been holding well between treatments, so that seems like the sweet spot. There was one time that we pushed it to 14 weeks, and Ellison started the twitching again. It could totally have been a coincidence, but we definitely notice that he feels good afterward and the twitching that he had from time to time has pretty much gone away totally. Ellison and his sister Abby are now approaching their 3rd birthday, and both are beautiful, loving, fun and smart members of our family who bring us so much joy. While we don’t know what the future holds for Ellison and his hips, we know that we will do whatever it takes to keep him healthy. Jen- what a great letter. The best part being that Ellison is doing great but is able to realize when he might need a “time out” if uncomfortable. I recently had the privilege of meeting Susan and John and now have Sugar as our latest family member. Sugar has brought me so much joy… She is eight years old and retired but still such a lovely sweet loving girl. Wishing your family and fur babies a happy healthy life! Thank you, you too! Susan and John are great and their cats are the best! So glad Sugar found a wonderful home with you!